I’ve written several times that the left wants big tax hikes on poor and middle-class taxpayers. Simply stated, that’s the only way they can finance a European-sized welfare state. Some of them even admit they want to pillage ordinary taxpayers. The editors at the New York Times endorsed higher taxes on the middle class in 2010. Now we have another addition to our list. Writing in today’s Washington Post, two law professors from UCLA openly argue in favor of tightening the belts of average Americans to enable a bigger federal government. …we need more tax revenue from the middle class, not less. They start by complaining that middle-income taxpayers have benefited from big tax cuts over the past 35 years. Middle-class tax burdens are at historic lows. The Congressional Budget Office reported in 2016 that the average federal income tax rate for the middle class — here meaning the middle 60 percent of the income distribution — declined from 7.8 percent in 1979 to 3.4 percent in 2013. Focusing on all federal taxes (not just income taxes), the average tax rate dropped from 19.2 to 13.8 percent over the same period. With these lower tax rates, the share of taxes paid by the middle class has also declined. The middle class paid 35 percent of income taxes in 1979 but only 16 percent in 2013, while its share of all federal taxes fell from 43 to 30 percent. As far as I’m concerned, this is good news, not something to bemoan. Indeed, my goal is to have similar reductions in tax burdens for all taxpayers. But the authors raise a very valid point. We will have giant tax increases in the future and people at all income levels will be adversely impacted. Though there is one way of avoiding that grim European future. Unless Congress is willing to dramatically cut major entitlement programs. Incidentally, we don’t need to “dramatically cut” those programs. The authors are relying on dishonest Washington budget math. In reality, the problem is solved and tax increases are averted so long as reforms are adopted to ensure that entitlement programs no longer grow faster than the private sector. But that’s not what the authors want. They actually look forward to big tax increases. What the middle class needs is not meager tax cuts but a muscular commitment to robust public institutions designed to benefit middle-income individuals. The higher taxes could come from our current income tax (from tax increases on the middle class and the wealthy) or a broad-based consumption tax (such as a VAT or carbon tax). I’m also not surprised that they embraced a carbon tax or value-added tax. By the way, the column compares the United States with other industrialized nations. Simply stated, we win (at least from my perspective). Data from the Organization for Economic Cooperation and Development reveal that American families with children face substantially lower average income-tax rates (in some cases, less than half) than similar families in other developed countries. And this is before factoring in consumption taxes, which represent a large share of middle-class tax burdens in most countries, but not in the United States. Those are remarkable numbers. Income taxes grab a much bigger share of family income in Europe. And then governments take an even bigger slice thanks to onerous value-added taxes. The authors would argue that Europeans get “robust public institutions” in exchange for all that money, but what they really get is less growth and lower living standards. 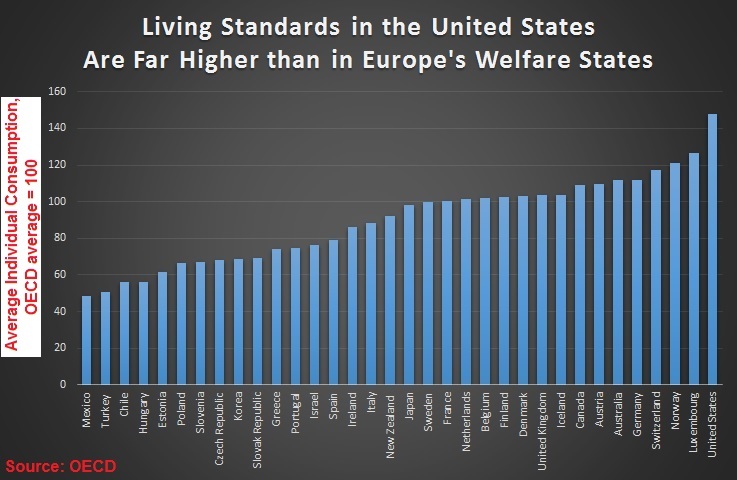 Indeed, it’s worth noting that the richest European nations are on the same level (or below) the poorest American states. That’s not exactly a ringing endorsement for higher tax burdens. The bottom line is that left-wing politicians usually pontificate about raising taxes on the rich, but the truly honest folks on the left openly admit that the real targets are lower-income and middle-class households. John, your views are wrong. Just read the Republican tax plan, use a calculator and see for yourself how they raise taxes on the middle. You shouldn’t make the Republican Party your god. People on the Left of the political spectrum don’t give a damn about the middle class. They claim they do, however, their words and actions are in opposition to each other. Really Big Government requires going after the largest pockets of money. High end: Billionaires make a lot of money, but there are so few of them. Low end: Lots of people with low incomes, but… their incomes are low. The middle (defined as $50k to $200k): Here’s where the big money is. This is lots of people AND fairly significant incomes. Those idiots are more than welcome to send in more than their share of taxes. Oh, but that is not what they are talking about. It’s not THEIR money they want taxed. It’s YOURS.